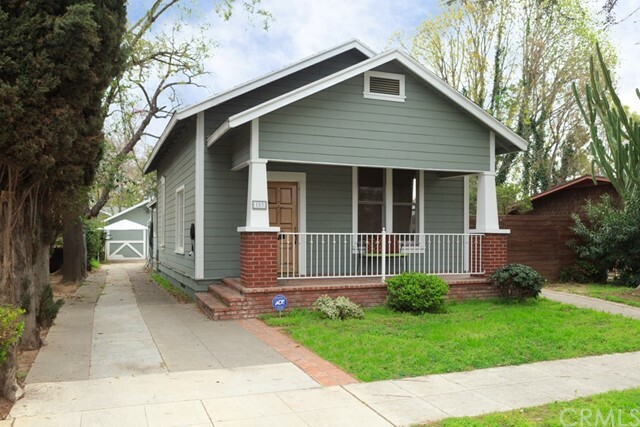 Ideally located in Old Town Tustin, this historic 1890 home is the oldest on North C Street. The home was originally built from a Sears kit in Orange and moved to its current location on North C Street around 1922 when this tract was opened up. A large, detached,circa 1910 double garage is located in the rear of the yard. The home still retains much of its original charm from the beautiful bay window with its original glass windows to the front porch which was added around 1910-1915. Plus, this home has been remodeled to make it up to date for today's lifestyle--a remodeled kitchen with a breakfast bar, wood flooring throughout, remodeled master bath, three bedrooms with closets in all, plus a huge backyard. Backyard has a half basketball court, a fenced deck for enjoying your morning coffee or evening glass of wine, plus beautiful, redwood fencing for privacy. Make this home your own and enjoy all the delights of Old Town Tustin from its walkability to local eateries, to the Farmer's Market and to Peppertree Park to all the community events, including the Old Town Chili Cook-Off, Tustin Tiller Days Parade and Broadway in the Park. Plans for a 2,000 square foot house included.